The views and opinions expressed in this article are those of Professor Keen. You should not act on these views or opinions without undertaking your own due diligence as to the voracity and accuracy of his views and opinions. These views and opinions may be wrong or misleading. 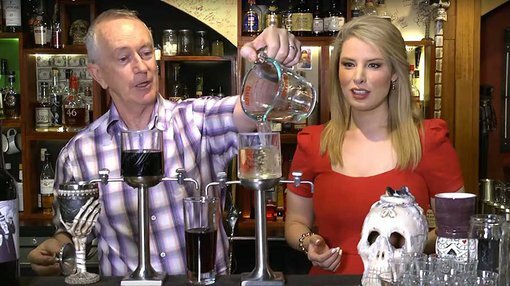 Steve Keen, Professor of Economics at Kingston University, pours drinks with The Capital Network’s Lelde Smits to explain the global monetary system and expose the impact of Brexit and Donald Trump over the next five years. Lelde Smits: Hello I’m Lelde Smits for The Capital Network. Joining me here at Sydney’s award-winning cocktail voodoo bar Papa Gede’s is Steve Keen, author and Professor of Economics at Kingston University. Steve, welcome back to Sydney. Steve Keen: Lovely to be here. Lelde Smits: Now Steve, 2016 will be known as the year that the forecasters and the crystal-ball gazers really got it ridiculously wrong. We ended up with Brexit, we ended up with Trump. In 2017 let’s forget about why it happened and instead look at what this really means for our global economy. Starting with the basics – How do governments and money work? Steve Keen: This at the moment is the economy. I’m not looking at the goods and services produced in the economy, I’m looking at money. How does money turn up in the economy? What most people think is the government makes the money. They think the government just pours a certain amount of money in, and that the government pours in too much. Steve Keen: A much easier system than that. Lelde Smits: One that goes far more than a few drops at a time. Steve Keen: That’s actually a bit like what governments are doing right now. Because they think they can’t put too much money in there otherwise they’ll run out. Lelde Smits: And what do we have on the other side then? Steve Keen: We have money coming in through here and we have debt, exactly the same amount of debt as money is stored by the banks and then you owe them what’s turned up over here. So we have a dribble of money coming in from the government. Most of the money in the economy is actually created by the banks. What the banks do is they lend you money, which is what is happening over here, and now you have a pile up of debt. Steve Keen: Governments create by spending. Banks create by creating debt. Lelde Smits: Well I think we’ve got to turn these taps off before this debt explodes. Steve Keen: That’s the trouble. We haven’t. The Central Bank has a limitless capacity to add money. So there actually is no possibility of the government running out of money. Lelde Smits: So Steve these are really the fundamentals here of government, bank, debt, but let’s look at actually how this is playing out in the global economy – and let’s move to Europe. Lelde Smits: So here is the EU, 28 countries, some smaller, some larger. Obviously Brexit has occurred. Article 50 will be triggered in the coming months. When we take the UK out of the EU, Steve Keen what is going to happen? Steve Keen: Well I’ve always said not very much. Because one thing that England did not do is join the Euro (currency). Steve Keen: What we have here is a different currency and there is no limit for the British capacity to continue creating its own money. Lelde Smits: So are you at all concerned about the impact of Brexit to the EU, what will it be to the EU? Steve Keen: My feeling about Brexit has always been that England is only a partial member of the club to begin with, it never joined the Euro, which is a gigantic difference between itself and the other economies. I think at some stage the club is going to disband. Because quite possibly Italy, and certainly if Marine Le Pen wins in France, they’re going to leave the club. And once they are gone, the club won’t be there anymore. Steve Keen: Brexit may be Britain getting out of the whole thing before the others getting out and being in a better situation because they are more prepared. Lelde Smits: Sure thing. Now if we get to the other surprise of 2016 it was of course Trump [US President Elect Donald Trump]. So let’s use this club for old America, maybe also some Havana Club. Steve Keen: It never has to stop. He’s going to enable the American economy to spend dramatically. Taxation is going to be cut. There will be an increase in government spending. There will be a large deficit coming out of that. So the government is going to be creating a lot of money and running a lot of infrastructure projects and so on. There are 4 million Americans who aren’t employed now who were employed in 2000. They are people who are going to get jobs in construction and start spending domestically and so on. And Trump is going to see that as boosting up the American economy. It’s all about Buy America, Made in America and so on. Lelde Smits: So Steve, Trump has made no secret of being friends with Putin, how do you think this friendship is going to play out over the coming year and how will it impact our European economies? Steve Keen: Putin gets demonized in America. I can understand if they’re demonizing [Joseph] Stalin or [Nikita Sergeyevich] Khrushchev even because they were competing political systems, you had a market-based system competing with a centrally planned system. That’s no longer the case. So, seeing this level of animosity, which is still being extended as if the cold war is still going forward, to me is quite remarkable. What you have got is a power struggle. Russia is trying to move in and have influence on the European Union...trying to break down the power of the European Union. Lelde Smits: And where do you think Trump will be moving in this scenario? Steve Keen: He will no longer be over here blocking. What you have with America in many ways is saying, we’re coming from the other side. We’re going to block your attempt to extend your power. And what is really being said by Trump is, we’re not going to bother about that anymore. Europeans, you’ve got to handle Putin on your own. Lelde Smits: So Steve we have the revolt against globalization very much in place now. If this continues over the next five years which of these economies are going to have the most liquid in their glass and which are going to be completely left dry? Steve Keen: Well I think what’s going to happen is this little club here [the European Union] is going to break up. Because I simply can’t see the Euro making it to 2021. By that stage I think the Euro is over. Lelde Smits: That’s your call? Steve Keen: That’s my call by that stage. Which means this little corral here breaks apart, which is actually going to be good for quite a few of them, particularly Italy. Because Italy has suffered so badly. Lelde Smits: And the US? How are they going to fare in five years’ time if we separate these guys? Steve Keen: I think America is still going to be the strongest economy on the planet. We actually haven’t spoken about China here at all. We need a bit of Maotai (distilled Chinese liquor) on the scene. I think the main rival is not going to be the European and Russian situation over here, it’s going to be what’s happening with China. Let’s bring, I mean this is rather Mexican, but we’ll take it as being one of the clay warriors. So in enters China. Lelde Smits: In enters a new player. Steve Keen: That is the main struggle, between America and China. Because, Trump is quite right to say, a huge part of American industry has relocated to China. And, that has undermined the working class jobs that meant people voted for him in what is called the rust belt. So they have lost their jobs to China. All the economists said he doesn’t know what he is talking about. Trump has got a much better handle on that than the professional economists have. Lelde Smits: Well Steve this is the space to watch and perhaps that’s our next instalment. For now, you certainly deserve a drink after all of this work. Lelde Smits: Steve thank you so much for your economic mixology and all the best for 2017.